Search For "Shopping & Stores" Companies in Champaign, Illinois - Click Here Now! Beautiful Handmade Bead Jewelry Necklaces, Bracelets, Earrings And More. Quality Workmanship, Excellent Customer Service, Low Prices, Free Shipping USA And Canada, Custom Orders Welcome. Many Styles, Sizes, Colors And Prices For Every Sense Of Fashion And Budget. I Like To Use Natural Gemstones Like Turquoise And Jasper As Well As Colorful Crystal, Glass, Gold And Silver Beads. Many Items Shown Can Be Made In Multiples Or Redone In Your Size. Your Comments, Questions, And Requests Are Always Welcome. Please Bookmark My Store For Your Jewelry And Gift Giving Needs. Thanks For Reading And Visiting My Jewelry Shop. 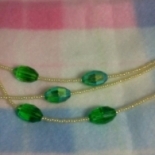 Bead Jewelry By Anita in Champaign is a company that specializes in Department Stores. Our records show it was established in Illinois.